I’m the proud owner of a new-to-me Singer Model 66 sewing machine! I’ve been dreaming of a machine that had a larger bed on it because my Kenmore only has 6 inches of room under the arm from the needle to the base of the arm. It gets rather crowded when you are quilting a larger project. As much as I’d love a mid-arm machine (or if I’m dreaming big, a long-arm, haha), my budget doesn’t even accommodate a low-end model. Enter Kijiji, which I’ve been stalking for a while hoping a quilting machine would just happen to pop up at a miraculous price after reading through all the quilting machine reviews. No such luck, of course, but in my Kijiji-browsing travels, I came across vintage machines that were just so attractive that I couldn’t stop looking into them. 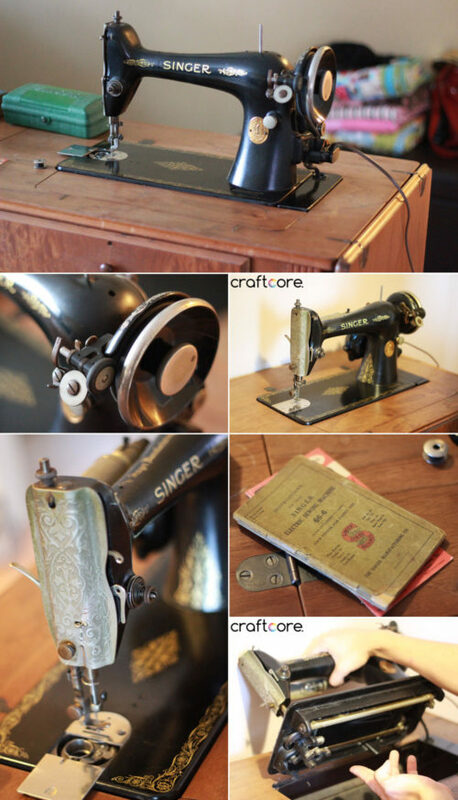 This inspired me to join the Vintage Sewing Machines group on Facebook which heightened my excitement to find a vintage workhorse of a machine. I came across a listing for the following machine, a 1930’s Singer 66, that had been in a man’s garage for 11 years. His mother had given it to his wife, but she had no interest in sewing so in the garage it sat gathering dust. As you can see from the pictures, the cabinet itself is in rough shape, with extensive water damage on the top. The edges of the drop leaf has further damage covered in masking tape. The machine itself was dirty from being unused, but under the dust, very beautiful. There was a burlap pin rag tied around the arm so the black finish is has minor scratching from where the pins came through the burlap. The listing price was $50, but the seller warned me that the machine didn’t work. We worked out a price of $40 since I wasn’t sure how much I would need to invest in the repair to get it in working shape. In the end, the seller told me he was glad the machine was going to someone who was planning to use it rather than just have it sit in the corner of a room. Isn’t she beautiful? The decal pattern is the most common Filigree pattern, so nothing fancy, but I still admire it. My husband got really excited about this refurbishing project and helped me get the machine in working order. Although the seller said the machine didn’t work, it worked perfectly when we plugged it in. We suspect that they didn’t know how to engage the knee pedal by moving it into the correct position. We followed the following video to clean and oil the machine. This lady is very thorough! The machine also came with accessories. First is this really cool Singer Buttonholer attachment. I haven’t tried it yet, but it looks like it’s in beautiful condition. 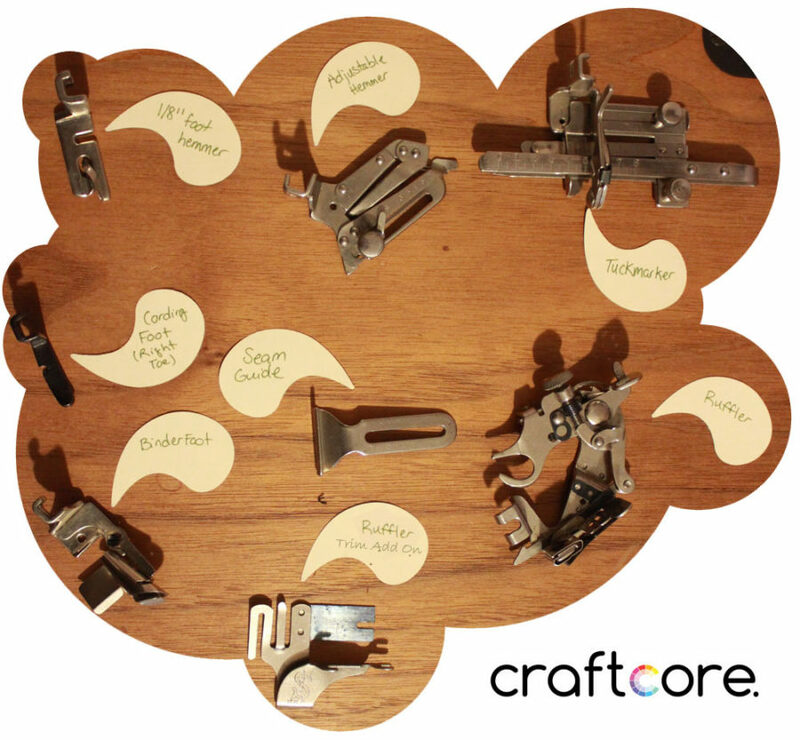 It has four different cam for buttonhole shapes. It also came with a cardboard box of various feet, attachments, razors, and bobbins. Most of the attachments had Simanco ID numbers on them, making it easy to find out what each part was. 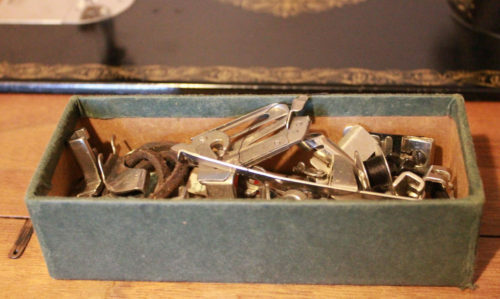 The Singer Sewing Info site had a great index sorted by ID number that was a great reference. To get this machine in working order for my machine, the costs were minimal. I had to buy a new light bulb, sewing machine oil, and a 1/4″ quilting seam foot. Since the attachments are low shank, I couldn’t use the 1/4″ seam foot from my Kenmore, and I can’t use a sewing machine without one now that I’m a convert! 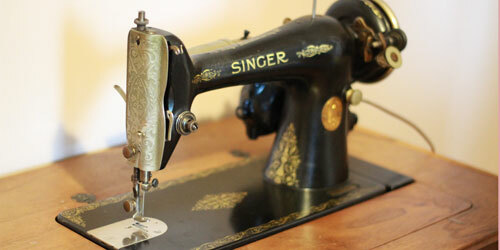 The Singer 66 is easy to thread and the bobbin winds more nicely than my modern Kenmore. 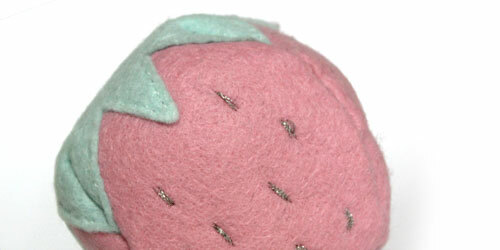 The outputted straight stitches are gorgeous; I haven’t experienced any skipped stitches yet. The throat space of the machine is 8″ from needle to the base of the arm, which is 2″ wider than my current Kenmore. I haven’t quilted a large project on it yet, but I’m excited to see how the extra 2″ of space affect my ability to manipulate the quilt. 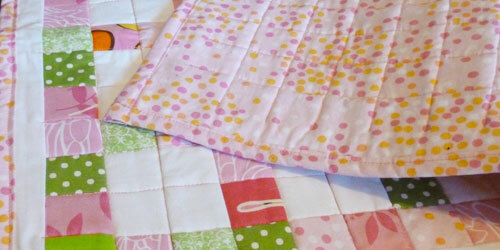 I completed my first project with it yesterday, a bound 11″ x 11″ mini quilt. It’s a gift so I can’t share it online until August lest the recipient might discover it, but I’m sure I’ll have another to share soon. If you are thinking about getting a Singer 66, I would definitely recommend it. Manuals are available online and there is a plethora of information available on Youtube, sewing sites, and the aforementioned Vintage Sewing Machines group. 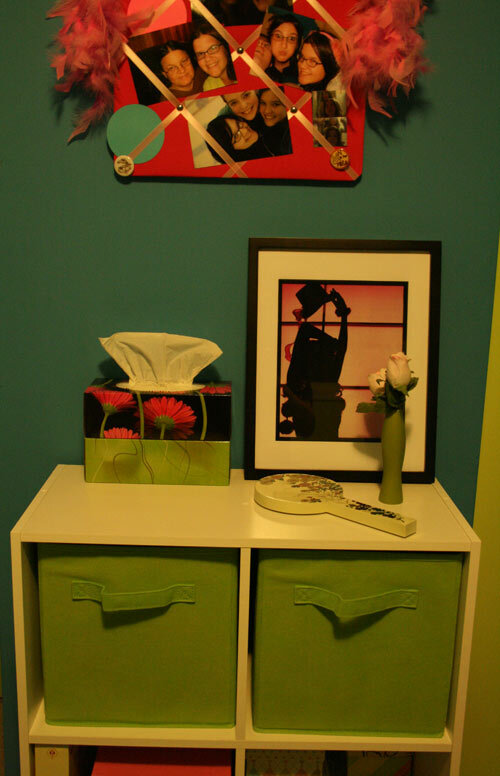 One day I’d love to refinish the cabinet, but that’s a future task! 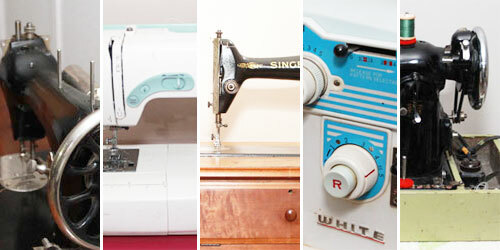 Do you use a vintage machine when quilting or sewing? Which model do you use? Thank you for the info on this machine. I have a couple I’ve been afraid to tackle the cleaning and repair!